Financial institutions have an enormous challenge in front of them. Regulatory oversight is at an all-time high, the digital revolution has transformed how customers interact with their banks and the traditional brick-and-mortar approach to banking has been challenged by online-only direct banks. Deposit pricing is an area that is significantly impacted by all these changes and has received minimal attention from senior management in the last few years. However, as the rate environment normalizes, deposits are expected to get very competitive. 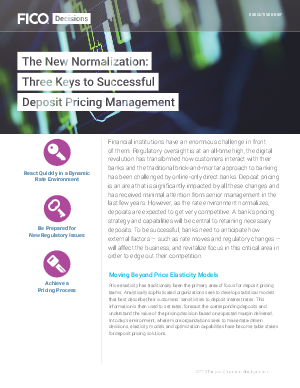 A bank’s pricing strategy and capabilities will be central to retaining necessary deposits. To be successful, banks need to anticipate how external factors — such as rate moves and regulatory changes — will affect the business, and revitalize focus in this critical area in order to edge out their competition.